12 volt d.c. photoswitches from Flexcharge. 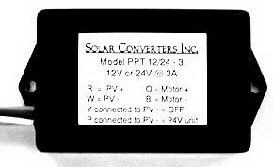 Solar Converters are made in Canada. take you to the item you need. our location, in Kingman, Arizona. Click onto image for a larger view. eight on and eight off events can be programed independantly. resistive (lighting or heating) load. Also has manual on/off override. Display and controls have a removeable plastic cover. Easy to set up with the handy wire terminals on the bottom. wire terminals and 1-7/8" front to back. of these ranges but the clock accuracy will change. 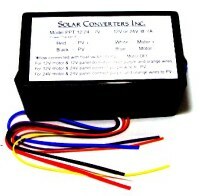 These are very popular for chicken coop lighting control. We have been using a Flexcharge timer for outdoor area lighting for years. ship your order complete when they come in - NO partial shipments on these items. the day when connected directly to a photovoltaic module. module to pump only system. power is low enough to damage it. pump and would just operate it when connected directly to the pump. Custom output voltages can be special ordered. is being shown for reference purposes only. Output Voltage: N/A function of load and solar panel, voltage limited to 30V. Settings are user adjustable in the field. Built-in fuse for protection, automotive style. Float switch input for on/off control. Dimensions: 4.5" by 2.1" by 2.1" thick. 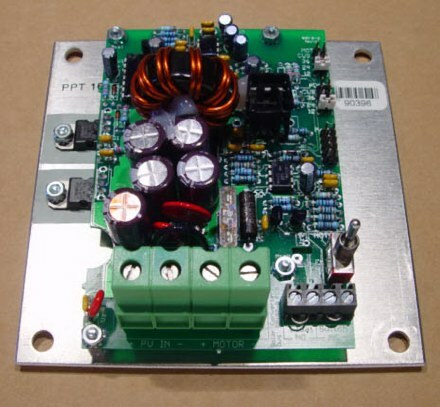 Output Voltage: N/A function of load and solar panel, voltage limited to 31 V.
Output Voltage: N/A function of load and solar panel, voltage limited to 15.5 V.
12, 24 or 36 volt photovoltaic array input. 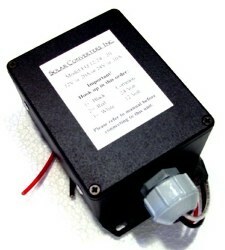 12, or 24 volt output to motor/pump. 25 amp automotive type fuse internally mounted. Transient protected on both the input and output. The switch shown in the lower right hand corner controls the float switch function. 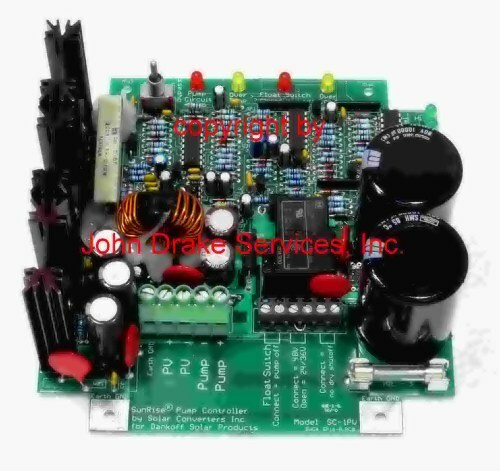 The jumpers in the upper right hand corner of the board sets the voltages. Efficiency is greater than 94%. We stock this in the open frame version so you can mount it in your own enclosure. Nominal output voltage: 12/24 volts. Nominal photovolaic input voltage: 12 or 24 or 36 volt. With a standard 12 volt panel it will operate a 12 volt pump. With a 24 or 36 volt panel it will operate a 24 volt pump. Maximum output voltages are either 15 or 30 volts. Maxumum output current is 16 amps. It can handle a Surge current of 30 amps for Ten Seconds. The mounting plate is app. 4-7/8" square. Dimensions: app. 5-7/8" by 5-15/16" by 2-3/4" front to back. 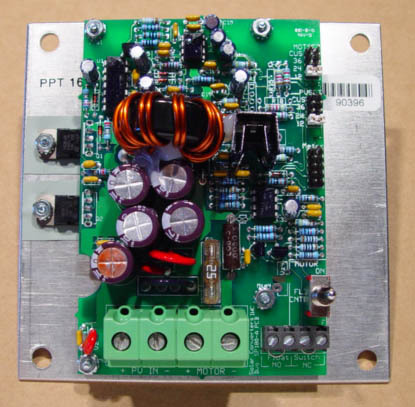 Can not be mounted directly to an electrically conductive surface. 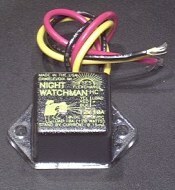 2) Flexcharge Night Watchman 12 volt d.c. photo switch 10 amp rated. Great for porch lights, outside lighting and signs. Has a built-in relay so that it will operate fluorescent lights. Simple to wire and weatherproof. In the standby mode these draw 15 ma (.0015 amp) of current. Originally designed for use on boats. in stand alone alternative energy systems. Ideal for use with bow lights in marine lighting applications. Very popular with entomologists for use with night time insect lures. These are approximately 1" square and 3/4" from front to back. Currently we have 6 in stock. pumps, etc.) and can be set to a specific voltage. They are available in "Active High" or "Active Low". goes down (active low) to a set point. connection, when the voltage set point is reached. This is also known as the simple switch . voltage reaches the set point. the relay will be energized. the relay will be de-energized. comes back up to the high set point. There is a three second delay when the voltage reaches the set point. Very simple to set-up and use. The internal relay with handle from 30 amps at 12 volt d.c. up to 8 amps at 48 volt d.c.
as well as up to 30 amps at 120 volts a.c.
We stock these in the open frame configuration. weeks for delivery from the factory. dollar amount of your order and offers Priority Mail shipping. 2) We accept telephone orders and accept Mastercard, Visa and AMEX. 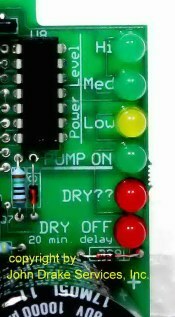 digital timer from a 24 volt d.c. or 48 volt d.c. battery bank. bank to "become out of balance." two lugs on the left. Please call us at (562) 423-4879.